Stayed for 5 nights recently fall 2018. Pre-arrival was smooth and easy, well organized and all aspects taken care. Also they helped organize, thru local Super U grocery, online purchase and stocking of kitchen worked very well. Google takes you to the back of the house and at night is marginally marked, but we made it around. It's too bad Google does this, the front treelined avenue is beautiful. Property is lovely and has much potential. We were disappointed that it appears to have been left for end of season, just closed and not well cleaned for our visit and to be recently turned into this current use and has evidence of being updated, new paint and newer euro style kitchen appliance worked well. Furnitures are an eclectic mix of used old furnitures and a bit sparse. Some could use refinishing for comfort. Many bedrooms with few bathrooms, are to be shared. water pressure was great, plenty of hot water, towels were a bit worn but plenty of them. Having washer and dryer was useful. We seem to have caught them at end of season, October, as the pool was turning green, perhaps having been winterized just recently but this was not disclosed before hand. It is nestled in hilly vineyards with several current age homes next door but we saw no one else. We did have several surprises of no real consequence. Cupboards were stocked with old rotten foods. The cleanliness of the kitchen was below average like you would expect at the end of a season. No garbage cans were possible in whole house except kitchen. A hunt was held one morning 4am with dogs barking for quite some time before run, and then shortly thereafter guns shots, it would have been nice to have been told this was schedule so close (next door fields) just to not be surprised. But no big deal really once you woke up and realized what was occurring, kind of fun otherwise. Lighting is very poor, lamps are needed, certain ceiling fixtures are exposed electrical that needs repairs. For the price I expected much better and more. I would in looking back for this time of year prices should have been adjusted down significantly for what was provided. We stayed with a group of friends for 4 nights, and didn’t want to leave! House is beautiful, pool amazing, and Eliane was a fantastic host- nothing was too much trouble. Would highly recommend! Amazing villa for big groups! We stayed during July 2018 and had an amazing week! 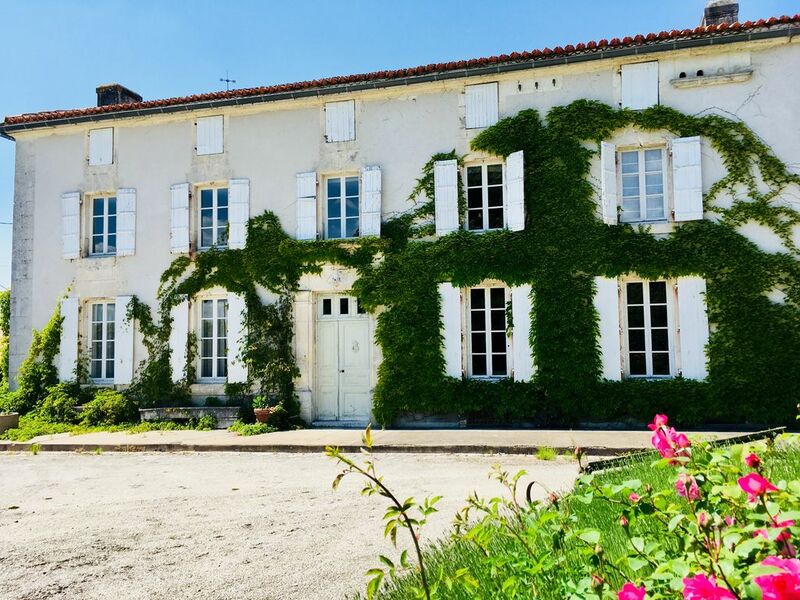 The house is massive and cool for when very hot outside, rustic but se in beautiful grounds with a big pool - perfect for a big group get away. Eliane and Leigh were very accommodating and helpful! Totally amazing - a stunning chateau! The house is absolutely beautiful and the surrounding area so gorgeous. We had a completely fantastic holiday and couldn’t recommend the house more. Eliane was wonderful at communicating and so helpful and friendly. Thank you so so much!! This gorgeous mansion in Nonaville is akin to discovering a fairytale you hope exists, but so rarely does. The house itself is a dream - exquisitely decorated and renovated; its authenticity still perfectly retained and beautifully accented, the interiors so tastefully designed and furnished with artistic refinement. This was a true French experience, from visiting the small villages of Châteauneuf-sur-Charente and Barbezieux-Saint-Hilaire for market days and daily fresh croissants and baguettes. You definitely feel part of the region and swept up in the warmth of the community. The region of Charante itself holds so much history and extremely interesting to explore. I spend so much time traveling, all countries and regions; and this was a very special place for both my husband and I. The majesty of the landscape and the house together were breathtaking. You can feel the love and spirit which Eliane has created here. I want to return again and again.